Model Year 2019 The latest offering from Jeep. The new 2019 Jeep Cherokee has arrived!!! The 2019 Jeep Cherokee takes the authenticity and craftsmanship of traditional Jeep Brand design and enhances it for modern adventure. New front and rear design, improved LED headlamps and taillamps, coupled with wheel designs and premium exterior convenience features evolve Cherokee styling while holding true to its renowned roots. SEEN IT ADVERTISED CHEAPER? Give us an opportunity and call now. Please note we are one of the biggest dealers in the Top Of The South with yards in Nelson and Blenheim, to avoid an unnecessary trip please contact the nearest dealership before coming to view a vehicle. Discover for yourself the benefits of buying your next new or used car from Houston Motor Group, authorized franchise dealers for Chrysler, Dodge, Jeep, Mercedes-Benz, Mitsubishi and Peugeot. 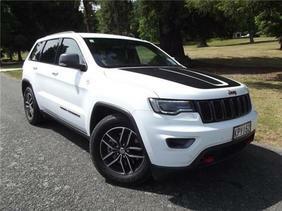 We offer: 1) Full hire purchase available 2) Full backing of a franchise dealership 3) Extended warranties also available 4) Competitive insurance policies 5) Factory trained technicians Houston Motors can arrange delivery of our used cars throughout New Zealand (Transportation costs may apply).